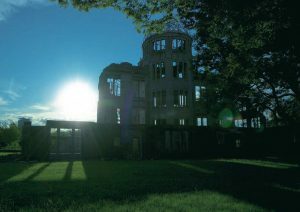 As a university located in the city that experienced the first atomic bombing in human history, Hiroshima City University established the Hiroshima Peace Institute in April 1998 as an affiliated research institute. The Institute conducts peace-related education and academic research that aims to contribute to the abolition of nuclear weapons, the establishment of world peace, and the development of local communities. The establishment of the Graduate School of Peace Studies aims to contribute to the realization of world peace by providing a curriculum that fosters graduates who have acquired; i) analytical academic methodologies in specialized areas such as peace studies, international politics, international law and international relations, and ii) the specialized and wide-ranging skills needed to analyze a diversity of real problems. (3) Journalists and mass-media specialists who have acquired the skills to astutely and systematically analyze a diversity of issues including current international disputes and global problems, and who have the ability to share information with civil society and the international community from a peacebuilding perspective. 2019.4.8 October 2019 Admissions Guide released. ●Please download admissions and the prescribed forms from the following link. You must print these forms in A4-sized and white-colored paper. ●The following PDFs are shown for reference only.